Shared, read-only lab with Bosch sensors publishing unique JSON messages with temperature telemetry to the public broker BROKER.HIVEMQ.COM. Access it here . Test your Crouton dashboard subscriber application by connecting to BROKER.HIVEMQ.COM:8000 as shown in this 1-minute Youtube video. You can use the online Crouton dashboard or if that is not available or flaky, you can install Crouton on your intranet as detailed in the Github project page . 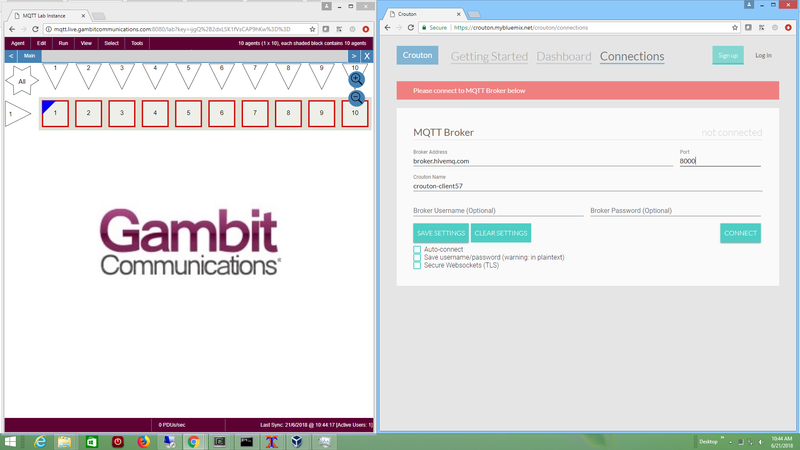 First connect to the broker.hivemq.com MQTT Broker in the Crouton Connections page as shown in the video and press CONNECT. Add the sensor to the Crouton dashboard by copy/pasting it's serial number from the Agent->Variables dialog into the Crouton dashboard. Start that sensor by selecting the stopped (red) icon, then invoke Agent->Start. Crouton will show Status: good. To change the temperature, select a running (green) sensor, invoke the Agent->Variables menu item, and change the temp variable. You can do the same with any number of sensors in the lab. For other web-sockets client, use a SSL-connection to broker.hivemq.com:8000 as detailed here. You can also see published messages with any other MQTT subscriber client, eg.